Children’s textbooks, from science to history, show no nearby scenes, suggest or demand no firsthand knowing, just formulas and far-off people and places, as if numbers and language had no local meaning, as if their present had no past, no future, the student a vessel not an actor. We developed City as Classroom, City as Laboratory and Boston Intertidal Exploration as a series of community-oriented experiential learning sessions intended to combat the disregard for nature in and of cities. The ecological fabric of urban spaces is still taught in contrast to that of their far-off, “naturalistic,” and non-urbanized counterparts. Yet, cities are brimming with uncharacterized ecological tales (for example, novel modes of plant adaptation and stronger genetic drift in some vertebrate species). Even so, it’s typical to escape concrete boundaries in order to experience, or characterize, the natural. Fieldwork occurs in dense jungles or isolated mountaintops, but rarely in urban green spaces, vacant lots (15% of land in the US is considered vacant or abandoned), or highway shoulders. As climate change increasingly tightens its grip on developed and undeveloped territories alike, rational and resilient ecological design becomes increasingly necessary. 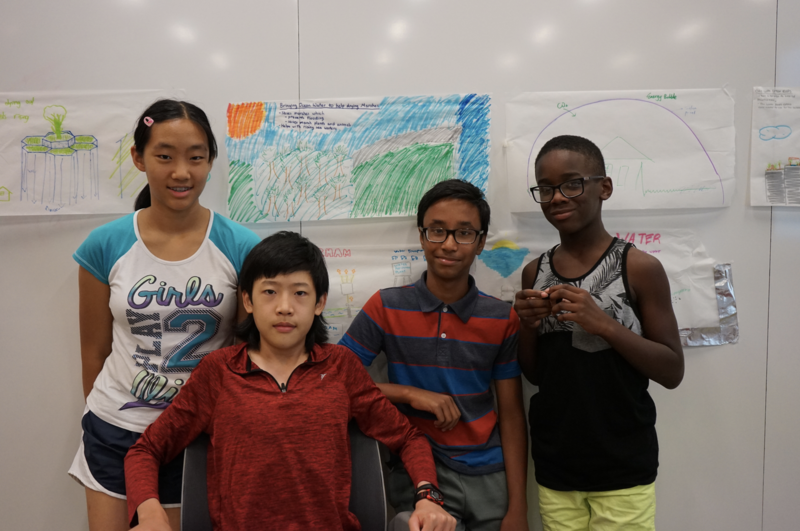 Working with a cohort of neurodiverse Boston-area students, we sought to explore new forms of design thinking, employing a systems-level, nature-conscious, and playful approach in order to further understand local urban ecology and how to create more resilient cities. Historically, cities were thought to be devoid of biological nuance—the antithesis of nature—and certainly not worthy of ecological investigation. Cities were the other—parasitic on their surrounding countrysides, containing no lifeforce themselves beyond the humans bustling within. In the mid-20th century, though, scientists in West Berlin began to spearhead the urban ecology (or perhaps the ecological urbanism) movement, inspiring citizen scientists and academics alike to document the living systems contained by cities—as well as the fundamental, biospheric processes they orchestrate. In doing so, they pioneered wildlife conservation ideals in future urban development. When construction of the Berlin Wall begin in 1961, many wildlife biologists and ecologists in the West were cut off from their fieldwork sites in the East, located primarily in the province of Brandenburg. They were therefore forced to study, and experiment within, the environments and conditions available to them (primarily, rubble-filled cities). Over time, many West Berlin ecologists—and in particular Herbert Sukopp, a professor at the Technical University of Berlin—began to recognize and revere the biological forces operating within urban contexts, particularly in areas recently decimated by the destructive forces of war (notably, the Südgelände railroad, in the district of Schöneberg). Urban ecology took hold of Berlin residents: students attending universities in West Berlin under the tutelage of pioneering figures like Sukopp (as well as the educated, urban middle class, Bildungsbürgertum, and amateur naturalists, Naturfreunde) began to extensively characterize the environmental forces dictating the organic facets of the urban landscape. In most instances, individuals working to characterize these processes also took part in political activities related to development and the landscape, bridging the gap between science, planning, and policy. Acquisition of knowledge translated directly into activism. In the United States, we have yet to undergo a similar renaissance in regard to designing with and for nature, rather than against it. 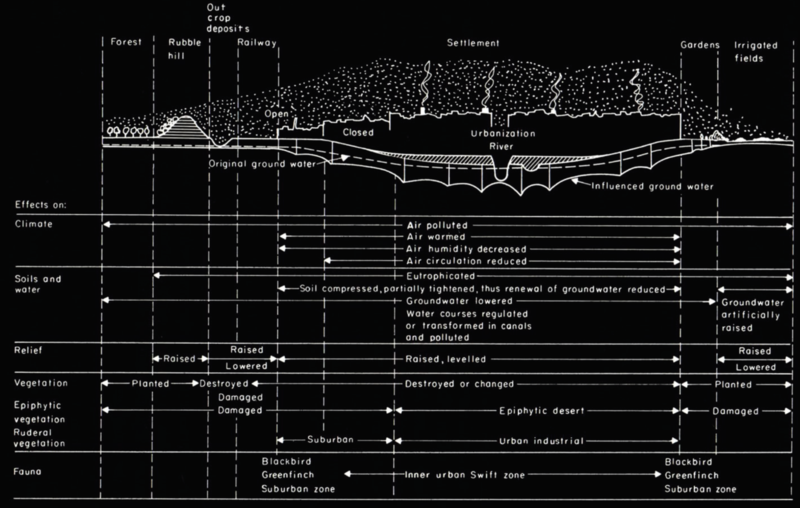 Movements in ecological urbanism (with roots in McHarg’s notion of landscape design as environmentalism) implore systems-type thinking, which advocate designing for air, water, land, and life simultaneously, but tenants of these frameworks haven’t yet gained universal traction. As a result, cities continue to be further developed without the forces of the natural world in mind. Overwhelmingly, this culminates in disaster (like poor air and water quality, increased flooding, and sinking cities). We posit that shifts in educational efforts related to environmental sciences are necessary to address this shortcoming of human-centered design. It is vital to inspire the next generation to protect the future of the living world through altering human behavior, settlement, and modes of development, while understanding the ecology of cities and engineering strategies with which to address these issues. The most advantageous route, we think, is to work directly with the scientists and city-builders of tomorrow. 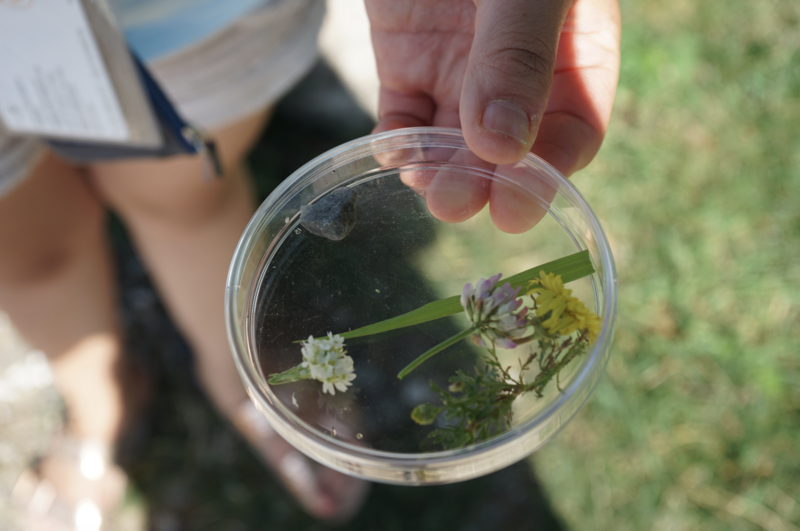 Our curriculum employed the city of Boston—and in particular its “urban wilds”—as both classroom and laboratory. Urban wilds—remnant zones of now-fragmented, once-pristine natural landscapes persisting adjacent developed land—have a long and robust history in Boston. In 1976, the Boston Redevelopment Agency designated more than 2,000 acres across 143 different parcels in the Greater Boston area as urban wilds in an effort to highlight their social and ecological significance and ensure future preservation. Indeed, these sites harbor substantial value in multiple dimensions, including both natural science and environmental humanities. Yet, despite their potential as learning tools, laboratories, or fieldwork sites, Boston’s Urban Wilds Initiative lacks a comprehensive or formalized guide for understanding how these sites might be used to illustrate urban ecology. 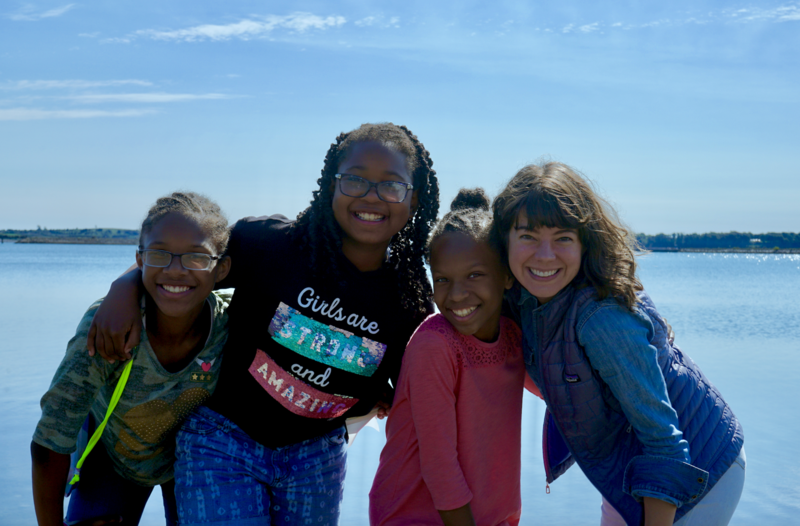 Over twelve weeks in the summer of 2018, we hosted workshops focused on urban ecological immersion and landscape literacy—each taking place in a different Urban Wild site. Students engaged in both creative and technical exercises to experiment in the city around them. Activities included building microscopes, developing sensors and spectrometers, prototyping green infrastructure, specimen collection, and more. 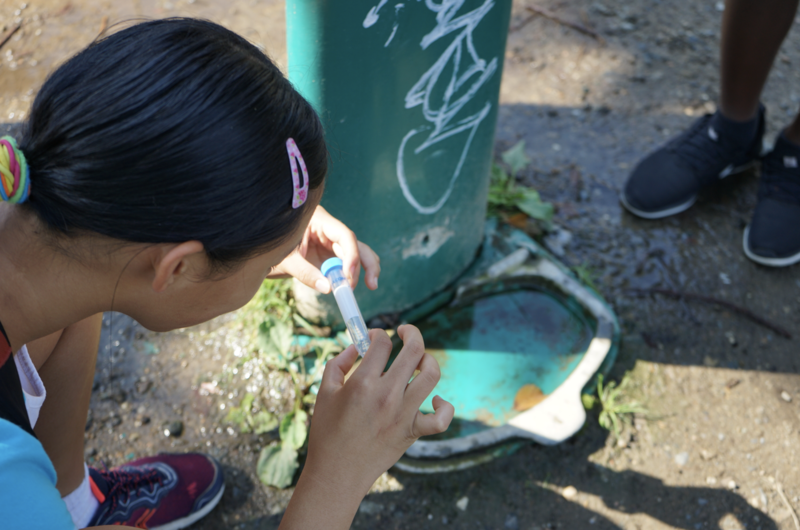 To begin with, students learned to utilize their most potent tools for environmental analysis: their senses. Together, we understood the ways in which the body is a sensor—a tool for gathering information, or data, about the world around you—an innate mechanism for detecting nuance in the landscape. Only by cultivating skills in evaluating the qualitative aspects of our living world can we begin to progress towards more robust exploration of the urban environment. Working with the Open Ocean Initiative, we extended our focus to also consider urban oceans with a workshop focused on experimentation in the intertidal zone. Presently, over 40% of the world’s population lives within 100 kilometers of the coastline, often in seaside megalopolises. While it is known that urban-adjacent marine ecosystems are subjected to unique stressors—namely unparalleled amounts of pollution stemming from urban runoff—efforts related to ocean conservation, as well as marine ecological investigation, most frequently concern the open sea, beyond the immediate reaches of urban ecosystems. 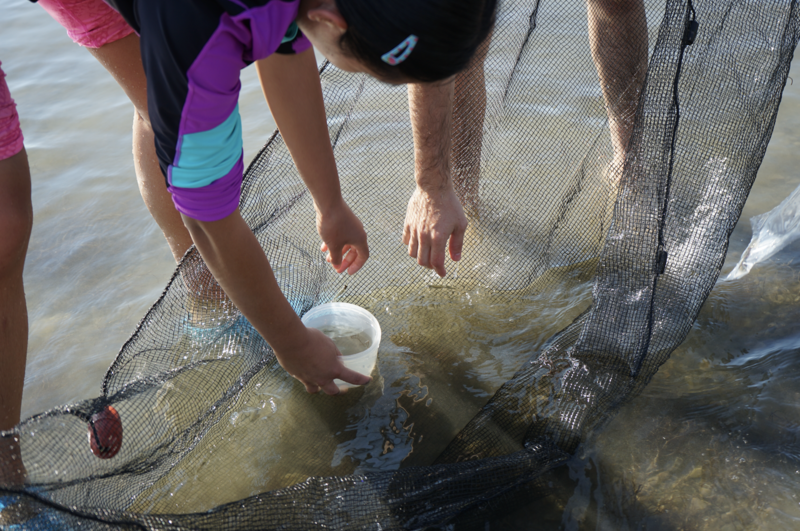 Students took to Pleasure Bay in order to investigate scientific questions as diverse as crab motility rates, distribution of fishes and sea squirts, and the the biometry of snail shells. Weekly observational and design challenges tested the students’ ability to visit a site, see its past and potential future, appreciate its strengths, and consider its weaknesses. A green infrastructure design prompt resulted in new ways to restore bee populations; revitalize salt marshes; reduce ocean pollution; transform plastics; and devise novel networks for ride-sharing and self-driving cars. Specimen collection combined with aerial drone mapping offered students an analysis pipeline incorporating the perspectives of both an insect and a bird—potentiating new views of familiar spaces. At the end of the series, students were challenged with an informal practicum—navigating the city and citing troubling designs, as well as positing interventions for more successful, sustainable futures. Each student demonstrated immense growth related to reading the landscape around them; students were excited to explore, examine plant species, run soil through their fingers, estimate water purity, and imagine ways in which to expand, construct, carve, and sculpt cities more responsibly. As in the case of West Berlin’s Naturfreunde, we hope that this passion and newfound landscape view will foster local environmental advocacy and activism. We are excited to work with public learning communities to enhance landscape literacy for a more ecologically-conscious future. 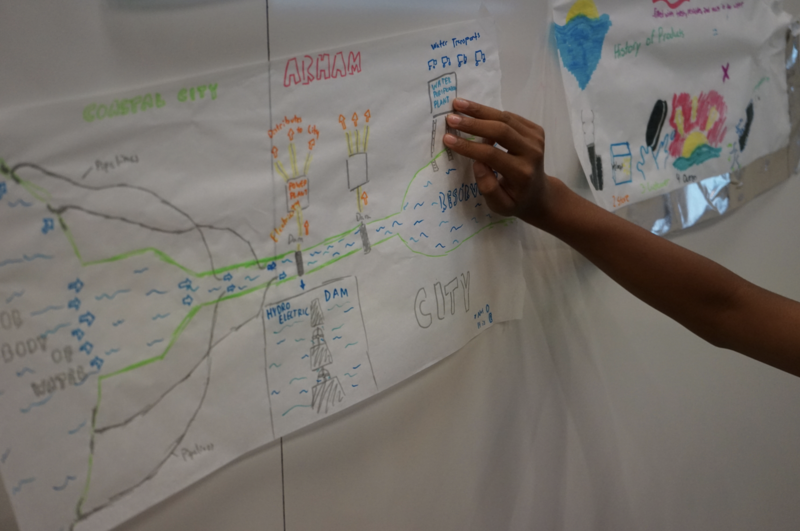 To run a session of City as Classroom in your own town, please contact Avery Normandin (ave@media.mit.edu). Eleanor Horton, Maryssa Russeau, Valentina Zhang, Jenni Chow, Carolina Bastidas, Juliet Simpson, Adam Horowitz, Agnes Cameron, Rafiq Abdus-Sabur; MIT Sea Grant, MIT Open Ocean Initiative, National Geographic Society, MIT School of Architecture and Planning (Bill Mitchell++ Fund).